If there's anyone who will hold true to their word of never going back to WWE, it's probably going to be CM Punk. However, most people are expecting/hoping that he'll make his comeback someday, simply because everyone always goes back to Vince McMahon in the end. As of this writing, it's unclear if Punk, who is 0-2 as pro mixed martial artist, will continue his MMA career, and if he does it probably won't be in the UFC, as he'll likely be released and allowed to go to a place like Bellator MMA. The talent roster in WWE is a lot different than it was back when Punk left in 2014, as it's a lot deeper, and it features a lot of guys that Punk has a history with on the independent scene. So, if/when Punk does come back, he'll have a ton of intriguing opponents waiting for him. 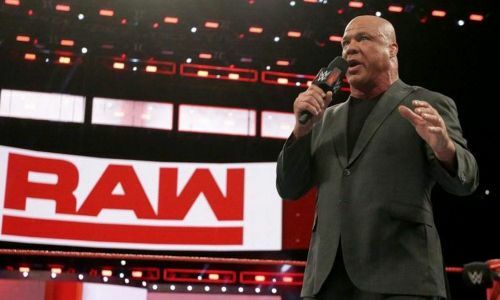 Rumor has it that current Raw general manager Kurt Angle is gearing up for an in-ring return, as he might start wrestling on a more regular basis in 2018. If that does end up being the case, then he'd be a great opponent for CM Punk if the ex-WWE Champion decides to make a comeback next year. Kurt Angle left WWE back in 2006, which was right about the same time that CM Punk made his debut on the WWE version of ECW, so the two never ended up having a one-on-one match with one another. Being able to work with a legit Olympic gold medalist who is considered to be one of the best technical wrestlers in WWE history would definitely motivate Punk, especially if they were booked in a submission or an "I Quit" match.